Breaking into the Creative Industry – with a helping hand | Don't mention the M word! Get Creative Careers aims to help young people access the creative industries via insider knowledge and video. Rob Jones - who is the driving force behind Get Creative Careers - worked with me during Shepton Digital Arts Festivals. Shepton Digi Fest also aimed to create links and opportunities between new talent and the Creative Industries. Rob has created a number of short films with creative industry people, including Aardman Animations. I was asked to talk about marketing – to give a first look at what marketing is and how a young person might like to approach finding out more about embarking on a marketing career. A while ago, I was trawling through blog posts when a spark of creativity caught my eye: ‘Going down like a Storm’ was its title. The content was so vividly descriptive and entertaining I was reeled in and beached, so much so, that I had to add a comment. In the course of expanding my museum skills I met Claire in Taunton Heritage Centre and to my amazement she revealed ‘Don’t mention the M word’ was actually her work! 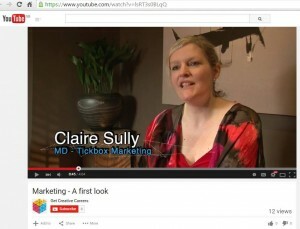 Claire’s skill in marketing shone through her blog and, in my opinion, she should not have any problem in explaining to a young audience of how the skill of Marketing, so expressively explained in her U-Tube presentation ‘A first look’, can help them carve out an international career similar to Claire’s.